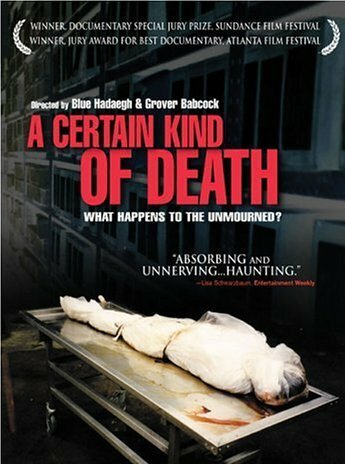 Unblinking and unsettling, "A Certain Kind of Death" lays bare a mysterious process that goes on all around us: What happens to people who die with no next of kin? Filmmakers Blue Hadaegh and Grover Babcock present this dark milieu in surprisingly composed and beautiful scenes. We witness a variety of public employees handling the bodies, personal property and money of those who have died alone, each worker helping nudge the deceased into non-existence. As each life is revealed to us, each is also drawn inevitably toward the same vanishing point. Crews haul away property, crypt workers prepare bodies for disposal. Appliances, furniture and personal knickknacks of the dead end up in a county warehouse, where auctioneers disperse them to strangers who know nothing of the prior owners. Unexpected ironies and compelling imagery force us to ponder the question "What is death?" For the unmourned people we have come to know in the film, it is total erasure. 80 minutes. Bluelips Note: If you are wanting to see how cremation is done this is the DVD for you. It will show you everything from the retort, to seeing the afterburners running, to even getting to see the main burner ignite a container. This DVD also shows the body towards the end of cremation and the pulverizing process. Excellent! Out of Print and becoming RARE!